Just thought I would let you know the clock has been delivered all safe and sound. The clock is just what we wanted and are very pleased with it. Just to say the lovely Edwardian chair arrived this morning delivered by your excellent friendly and helpful courier. The chair is just what we were looking for. It is exactly as you described and is the most attractive elegant design of such a chair that we have seen. It fits perfectly in a corner of our conservatory. Just to let you know the tallboy arrived safely this morning and is exactly what we were looking for. It is a lovely piece of furniture. Just to say the chest arrived today and I think it’s fabulous. Many thanks. “Thanks for offering this gorgeous heirloom quality addition to our home. Fortunately our son likes antiques too so it will be in the Starr family for a long long time. By the way. Whoever crated it are real professionals. Nicely done! I want to say how lovely the coffee table is. At the moment it is acting as a very glamorous TV stand but when we finish our renovation works it is going to be in situ proper, in an alcove beneath an enormous 19th century mirror. The delivery chap was great too! Thanks so much. Just a quick note to thank you for the smooth delivery and installation of our beautiful chest. It is lovely and really fits well in our home. Just to tell you that I have get my desk today at 13 PM a day before so that was nice service, it was a Polish driver very kind help me in with all the things, so I’ve been busy separating the modern desktop that I have and getting that great English desk. It has been a fantastic service all the way from your side and the desk look so beautiful in my room so many Thanks for the deal. Just to acknowledge with thanks receipt of the lowboy this morning. You’re carriers are very good, and I’m delighted with the table! The crate was delivered yesterday, and we unpacked it in the afternoon. We are absolutely thrilled! It is perfect in the space, and I have an old wood-framed mirror, which is the exact colour of the chest, hanging above it, and they look amazing! As though they were meant to be together. We are so pleased. And the chest arrived in time for the Family get-together, which starts on Thursday. I will have 24 or 25 people for 4 nights and 5 days! So every one of my 6 guest bedrooms will be filled, and the younger generation is camping! So thank you, Julian, and I must thank Simon, too. You both did a terrific job, and I am so pleased it arrived in time. My beautiful picture arrived so well packed it could have been sent to the moon! And arrived exactly as promised. The picture is exactly as it was described and Julian and his staff answered my questions and provided a very efficient service. They are a professional and knowledgeable team, this is my first attempt at buying something from a website so I am delighted with my purchase and very impressed with this particular firm. Thank you for delivering the bed last Tuesday. We have put it together and it looks amazing….I need a hoist to get in😉🛏 ! It was great to meet you and chat. The Rolling Stones were awesome so a red letter day for me!! We received the 10 chairs we purchased from you in April. They are fabulous! Just wanted to let you know. Thank you for all of your help! The chair arrived safely and in perfect shape this morning. It is as lovely as I hoped, and arrived a lot sooner than I imagined. Excellent item and service all around! The table arrived safely this morning, thank you for packing it so carefully. Exactly as described/pictured, we’re delighted with it, as I’m sure the recipient will be on the 31st (his birthday). We are enjoying the library table. It was quite a job uncrating it but it arrived in perfect condition. It has been a pleasure dealing with you. Thank you for the speedy delivery of the Georgian walnut table. I am very happy with it. I hope all is well with you. I want to let you know that the tables arrived earlier than I anticipated. They are lovely and arrived in good condition. I am delighted! I was happy they arrived before my daughter came to visit. She thinks they are very nice as well. I want you to know that I enjoyed doing business with you. I appreciated your integrity, honesty and your professional manner. I was also impressed with the shipping company you recommended. Vic was very good to communicate with me. They were packed extremely well. This was a great experience for me! I would do it again!! Afternoon Julian, Hope all is well. I have just returned from France….and unpacked the chippendale chairs yesterday. They are absolutely beautiful and perfect in the dining room in North Carolina. Thank you once again!! Hi Julian, Expressing my thanks for helping us arrange this so quickly. They are going in the Royal Suite at The Gleneagles Hotel so will be in a good home and well cared for. We hope to work with you again in future. Best wishes, Charlotte. Hi Julian, Our clock has arrived, securely packaged and intact. Thank you so much for all your assistance. Have a lovely weekend. Kind regards, Donnelle. “Julian, We received our chairs. The wife is happy, we all are happy! Thank you so much for you cooperation and if you ever need me to be a reference for you, do not hesitate to send anyone my way! You all are great. I will be looking for a sideboard, China Cabinet and other side pieces. I will keep an eye on your website! I am glad we have established our business relationship, and look forward to deals in the future! Thank you! Thank you! “Hi Julian, The delivery guys dropped him off – very thoroughly packed. We turned him round last night and he more than lived up to all our expectations! What a stunning piece of furniture, and with such a beautiful calm and tranquil presence. I didn’t think I would ever say that about a piece of furniture but of course he was once a living breathing oak tree, and probably quite a large one, and they often exude a serene and imposing presence. He is absolutely gorgeous, a show-stopper, and somehow draws the different eras of the house (from 1650 through to 2000) together just as we hoped. Thank you Julian, you were a pleasure to buy from, and because we trusted you that made the whole process of buying a large and valuable item online much easier. And we appreciated your support and guidance over matters like replacing the tips (we definitely feel it was the right call for us, and such a beautiful job has been made of it). We are over time looking for more oak pieces, simple and rustic and handsome like the dresser, so do let me know if you get anything new in – particularly hall tables and side tables.,”. “Hello Julian, I just wanted to let you know- the tables have arrived- safe and sound!! They are exquisite. Thank you so much for everything! Best regards, Gita Givertzman,”. “Hello Julian, David Brown delivered the Chest of Draws to us in France yesterday,(Sunday) , afternoon, well packed as always, it looks even better than we thought it would, the red string tying the very nice key in place I thought was lovely, (most string we see now is nylon), I think the secret locks are an excellent idea, so simple, yet ,unless you know of them, difficult to overcome. It sits now on our new oak floor, although when we have fitted the oak boards down in the long bedroom it will move into there, but I have yet to hand plane the boards, I have the handmade nails to fit them down. Very many thanks for your help on this purchase. Kind Regards, Chris and Jacquie Buckingham,”. “Dear Julian, we are very pleased with the quality of the furniture delivered to us early this morning. As you can tell from the attached photos they match well with our other english antiques. By the way you did an excellent job on wrapping the goods. We wish you a merry christmas season and all the best for 2017. Gudrun and Jochen Arden“. “Julian,We can confirm that the chairs arrived ok and we are very happy with them. Thank you for your support and we hope that you have a wonderful Christmas and a great new year. Best regards, Alan and Mimi“. “Hi Julian,I just want to let you know how pleased I am with the ‘Suite’ and thank you for your understanding with all my questions. My main fear was the ‘colour’ of the wood after restoration as it’s a fashion/trend here in Ireland to have a high false glossy shine on restored furniture which I hate.The colour is excellent and not in the least restored looking so over time a natural patination will built up. The condition was exactly as described on the website and truly excellent. My main problem is it looks so good I’m thinking of redecorating the drawing room so it ‘lives up’ to the suite. One again thank you for everything and I hope to do business with ‘ye’ sometime in the future.All the best,Jerry”. “Hi Julian, I forgot to write you after it arrived but I just wanted to let you know that the delivery went smoothly and the piece is beautiful. Thanks for everything. It was an an exceptionally professional and easy transaction. Thanks for handling all the logistics so well . Best regards,Tom Mathew“. “Good evening again Julian. Chair delivered 9.30 p.m. this evening! What a lovely piece of furniture, looks good, feels good, and by golly it does me good! Perfect match for my green leather top Edwards and Roberts knee hole desk, both probably of about the same date (say) circa 1880. It is already in use. Many thanks, Best Wishes, Roger”. 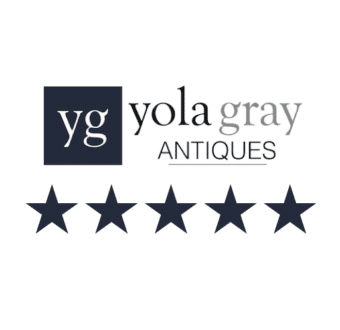 “A lengthy search for two items of antique furniture ended successfully at Yolanda Gray Antiques. A telephone call produced immediate confirmation that one item was definitely available and the other had only just come in but would be priced within 24 hours. There had been plenty of 19th Century chiffoniers on the market, most of which I considered rather too bulky. This one was of unusually small proportions and looked very elegant. Secondly, the Bentwood Hatstand which had just become available appeared to correspond exactly to my requirements. The photographs on Yolanda Gray’s website were of high quality and showed every detail of the items, which corresponded in every particular to the highly informative and accurate descriptions. I was able to verify the measurements, negotiate the price and arrange delivery over the phone with the greatest of ease. Two days before delivery, as promised, I was given a three hour time slot, more than reasonable considering the distance between Lancashire and London. The delivery took place at precisely the earliest time I was given to the expect. The items were very securely packed. Most important of all, the reality was entirely consistent with the photographs and descriptions. Both items are of superb quality and colour and in excellent condition. I recommend this dealer unreservedly”. “Dear Yolanda, just a line to say how delighted we are with the coffee table. We have just the spot for it and it will be treasured. Your service and delivery have been excellent. Kind regards, Anne and Mike Lindley“. “We are thrilled with the bedsides and they lock! We managed to uncrate them and they are now in situ. Many thanks”. “The bed looks great! I really like it. I am looking forward to having it here:) Many thanks to the carpenter, he has done a great job. I am very happy. Best wishes”. “Thought you would be glad to know that the clock is now in situ and working well. So all is well that ends well. Many thanks for your kind attention. We are very please with the clock, it looks great in our farmhouse kitchen and your courier did a grand job too”.